Reenact your favorite scenes from the manga, video game, and anime franchise Sword Art Online with this Dark Repulsor Cosplay Sword. 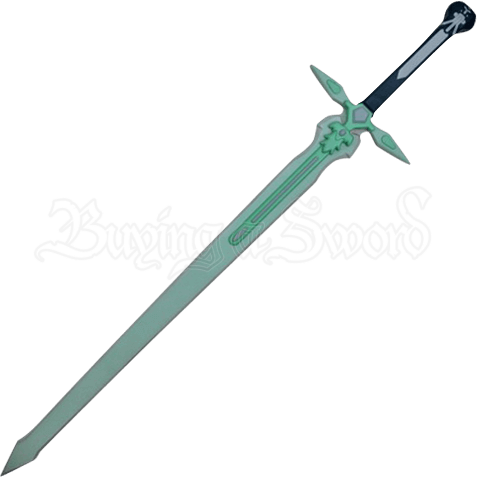 Officially licensed, this fantasy foam sword makes a prime addition to any Kirito cosplay ensemble. Crafted from dense latex foam with a unique fiberglass fusion core, this Anime costume sword is lightweight and extremely flexible. The durable latex construction with painted details provides a realistic look for any cosplay or theatrical production. The pale green blade is ornamented with brighter green and silver accents that extend to the diamond shaped guard. The navy blue grip and pommel display silver designs. Perfect for an anime or costume convention, this Dark Repulsor Cosplay Sword is suitable for light sparring.